First, run all jars and lids through the dishwasher. Set them in a pan of hot tap water in the sink. You have to keep everything sterile in order to do this right. Boil 4 cups of chopped and slightly mashed persimmons. Add 2 cups of raw, organic sugar. Stir it up. Squeeze in one pack of pectin. Keep stirring. Add 1 tbsp. or so of cinnamon and the juice of one lemon. 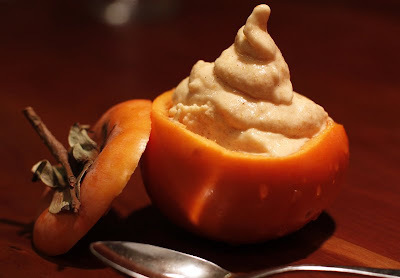 The persimmon sauce should be at a boil; ladle it into a jar, and wipe off any that gets on the mouth of the jar with a paper towel that's been dipped in hot water. Screw on the seal and the lid tightly and put aside to cool. It made 8 jars of sauce with a little left over for tasting. 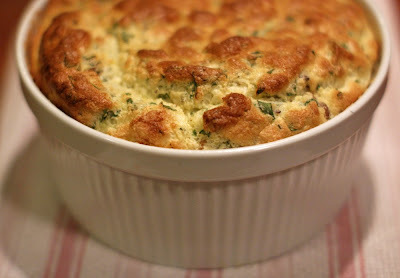 I make all kinds of souffles, but they all come from one basic recipe by Alton Brown. In an episode of his show called "The Egg Files," Mr. Brown explains the mechanics of building a successful souffle, and then sends you on your way with his simple recipe for one made with sharp cheddar. On the show he is very detailed in his explanation, but you can find a written version of the recipe on the Food Network site by clicking HERE. Once you have mastered the cheese souffle, you can shake things up a bit. In this version I subbed creamy goat cheese for the sharp cheddar, and then folded in some chopped spinach and a sauteed chanterelle mushroom. Though this dish is simple to make, it is sure to impress the hell out of people. Get creative by trying out a few of your own combos. Let the old TCV know what ideas you came up with. I'd love to know. Go ahead, try it. Go on. You can do it. You'll see. Up until a month ago I had never even tasted a persimmon, and now if I never saw another I might just be o.k. with that. You see, my older brother and his wife have a persimmon tree in the back yard of their new house. 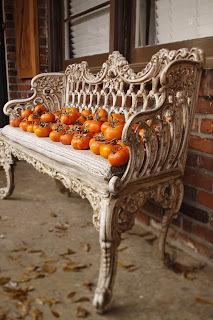 At harvest time everyone hauled away as many persimmons as they could. The Wife and I easily had 60 or 70. The great persimmon experiment of '08 had begun. Mix all ingredients in a bowl. 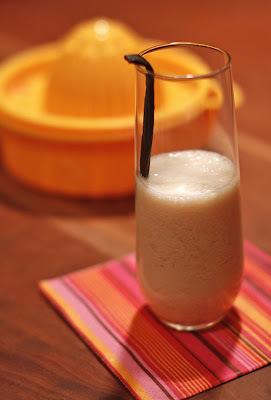 Pour mixture into your ice cream mixer. We have the kind with the freezer bowl, and it is brilliant. It is so easy. Let that sucker run for about 20 minutes and you will be up to your ears in persimmon gelato. It makes a nice presentation to serve it inside of a hollowed out fruit. The grilled portobello is a staple on vegetarian menus everywhere. The problem is not the taste, it is a hearty stand in for nearly any meat. The problem is simply how it looks on the plate. 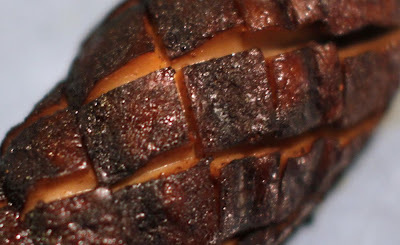 When grilled, the mushroom is dark and flat. You can cover it up, but that defeats the purpose of presenting it as the main course. So, I decided to try to figure out a way to bring out the mushroom's inherent beauty. This may sound silly, but we do eat with our eyes. It has to look good people. I simply took my knife and scored the top of the mushroom before I grilled it. Using my sharpest blade, I drug the knife across the face of the mushroom only allowing it to sink about 1/4 of the way through. I made a "tic-tac-toe" pattern using this method. Then grill as you normally would. I like to put mine on a hot grill for about 5 minutes per side, then move it to indirect heat until I'm ready to serve. To plate the mushroom, fold two ends under towards the center. This will open up the grid and make for a beautiful presentation. 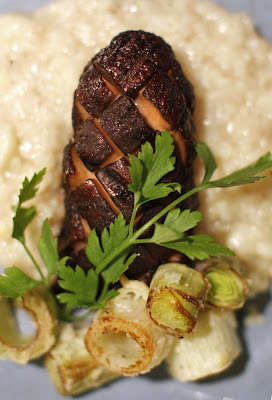 Here it is served with cauliflower risotto and little leek onion rings. That's Professor Chubby Vegetarian to You! The University of Memphis, of which I am an alum, has asked me to teach a continuing education class on vegetarian cooking for the "Living Well: Cooking in the Garden" series at the Memphis Botanic Garden. It is a one day class, and the cost is $49 bucks. I will do my best to make it worthwhile and fun. Click HERE for registration details and a course description. If you plan to attend, then please let me know. Also tell me your favorite recipes from the blog as well as what you'd like to get out of a class like this. I will tailor this class to fit you perfectly. We'll eat, make stuff, eat, and talk about food for a few hours. It'll be a blast. While you are on the U of M page take a moment to look around. Ken Lumpkin, chef/owner of Umai is teaching a sushi class, and Melissa Peterson, editor of Edible Memphis, is teaching both a knife skills and cheese making classes. That makes me in pretty good company. For some inexplicable reason, I have been receiving the magazine Family Circle in the mail. You know, the one with some buttery, crazy dessert pictured on the cover along with a "LOSE 20 POUNDS IN A WEEK!" headline? I love that. But I wouldn't really subscribe to this publication on purpose. It's a good thing some little Santa had me in mind for this children-and-marriage, cleaning-and-cooking magazine for the modern mom/housewife because some great, very simple recipes are featured this month. 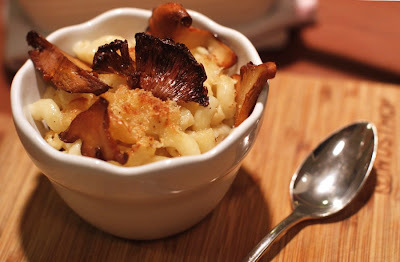 Last Friday, I showed TCV the tempting picture of a bowl of cheese macaroni and said, 'I want this for dinner.' We were out of time that night, but this week, he gave it a shot and as a bonus, made it extra-fancy. Now, TCV's family doesn't call him 'high-minded' for nothing. How it usually goes is when I want something like plain old mac and cheese, he takes it up at least ten notches. Sometimes this push-and-pull over food preference can cause the need for a dinnertime detenté. I like simple food; he likes it pretty complicated. I want the same old thing made the usual way; every time he makes a dish, it results in something new. This time, I admit that he was right to monkey with the traditional recipe. 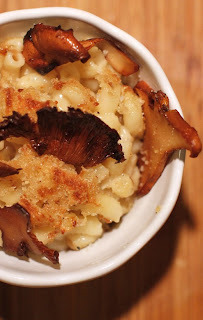 Fresh bread crumbs made from a bunch of bread leftover from a recent family lunch in Southaven + some Cabot white cheddar + our ubiquitous black truffle oil + sliced, sauteéd chanterelles + elbows = the best dinner I have had in quite a while. I think Greek yogurt was an excellent sub for milk, too. What a great possible-ice-storm dinner. In a large pot, melt the butter over medium heat. Add garlic and shallots. Once it stops bubbling, add the flour and whisk it all up. Cook 2-3 minutes 'til it just starts to change color. Add water and yogurt and whisk until smooth. Remove from heat. Add cheese, pinches of salt, pepper; stir until cheese is melted. Fold in cooked macaroni. Put it in a small, buttered baking dish. Sprinkle with bread crumbs evenly and drizzle with the truffle oil. Bake for 20 min. at 350. Place under broiler until top is golden brown. Take it out and place the chanterelles all across it. Looks very twee served in small bowls, and tastes best when eaten while you stand around in the kitchen. Taco salad night was quite an event at ye olde childhood Germatown home. My mom would get out the biggest pot we had, fill it full of vegetable oil, and put in on the stove. Once the oil was boiling hot, she'd float a flour tortilla in the oil. With a small metal bowl and a pair of tongs, she would press the center of the tortilla so it formed around the bowl as it crisped. Each one was a sculpture in oil and flour. It is a feat that I have never attempted. Never mind the fact that I avoid deep frying anything; I'm pretty sure I'd have one less house than I have now if I attempted such a thing. So I developed a less-dangerous method of attaining a crispy bowl for my taco salads. Preheat your oven to 375 degrees on convection if you have it. 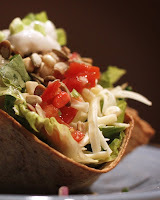 Take a flour tortilla, brush each side lightly with olive oil, and then drape the tortilla over a small oven-safe bowl. Place it on cookie sheet, and pop it in the oven. It will stay in the oven for 7-10 minutes until it is golden brown. Keep a close eye on these because they can burn quickly. Take them out and let them cool. Mix all ingredients in a medium bowl. Let this stand until you're ready to assemble the salad. Pour the mixture into a mesh strainer and reserve the liquid. This is what you will use to dress the lettuce. Now it is time to build your masterpiece. Start with a tortilla bowl, and then add some black beans in the bottom. Next up is the lettuce you tossed with the dressing, and then some cheese, followed by the spicy corn succotash, toasted pepitas, and sour cream. 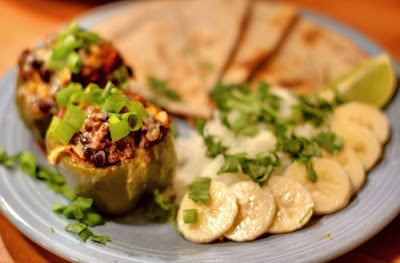 It's great with a slice of avocado or some guacamole and green onion. There are no rules here, people. 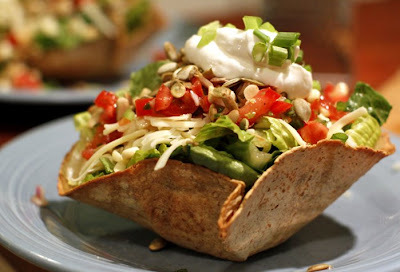 Have fun with your own taco salad night this week. O.K. today is the big day. 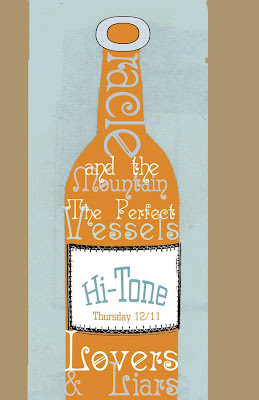 We, The Perfect Vessels, are playing our very 1st show at the Hi-Tone tonight. I'd love for ya'll to come out and watch us play. We will be playing a short set of original music. Click HERE to get a preview of what you are likely to hear. The music will start at 10:00 or 10:30, and TPV play 1st. Food note: The Hi-Tone serves some of the best pizza in town. If you have not tried it, then you should. i know what I'm having for dinner tonight. Preheat the oven to 275 degrees. Slice the eggplant about 1/4 to a 1/2 inch thick. 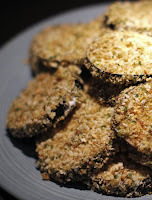 Dredge eggplant slices in the flour, the egg, and then roll them in the herbed bread crumbs. Arrange the Eggplant on an indoor griddle or large flat-bottomed pan over medium heat. Drizzle with olive oil, and allow the eggplant to brown on both sides. You are not cooking it through, just browning the bread crumbs. Work in batches if you need to. Transfer the slices to a large baking sheet and put them into the oven. The low heat will cook them through and retain the crispiness. The fast way to roast garlic is to put the garlic cloves skin-on into a dry, hot skillet. Allow it to cook until the skin is black. 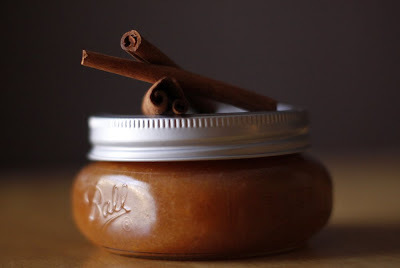 Let it cool, and inside the burnt skin you'll find a soft smoky, sweet clove of garlic. Mix the ricotta, roasted garlic cloves, and parmesan together using a fork. Throw your bread into the warm oven, and then toss the arugula with a tiny bit of oil and vinegar. 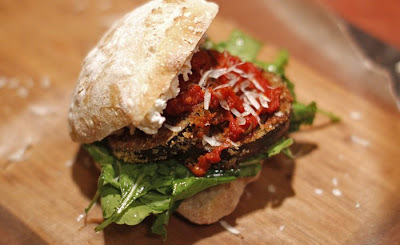 Once the bread is warm assemble the sandwich like this: arugula, eggplant, tomato sauce, sprinkle of parm. Spread some RGRS on the underside of the top bun and you are in for a treat. I accidentally caused some confusion over the eggplant that I'd like to clear up. I'd hate for anyone to eat raw eggplant. I begin cooking the eggplant by pan frying it. This serves to brown the breadcrumbs, and cooks the eggplant somewhat. Do not burn the bread crumbs on the outside just to be certain that the inside is cooked, because the eggplant will continue to cook in the oven. Here is a fun idea for you. 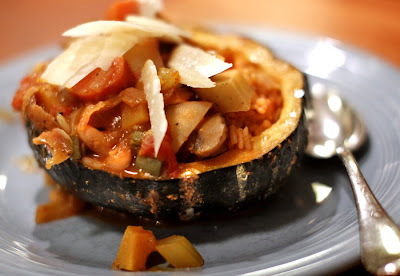 Next time you make stew for dinner make it special with squash. After a post-marathon fried food bender, I began looking in the fridge for fresh food with bright colors. I piled my cutting board full of carrots, mushrooms, parsnips, fingerling potatoes, celery, fresh herbs, tomatoes, beans, red onions, and kombucha squash. I began chopping vegetables, and throwing them into my new cast iron pot. I browned up some seitan and threw it in for good measure. I added enough broth to cover, secured the lid, set it to simmer, and watched The Simpsons. When my show was over, I noticed that I had left the squash out of the stew, so I cut it in half, seeded it, and roasted it in a 375 degree oven for about 25 minutes. In the meantime, I siphoned off the broth from the stew to make some rice in a different pot. 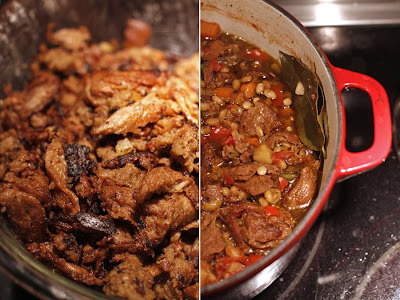 This makes the stew extra thick and the rice rich and flavorful. To serve I placed a roasted squash bowl in the center of a plate, then spooned in some of my rice. I topped that with a heaping helping of my redemption stew and some aged parm. I'm not joking. 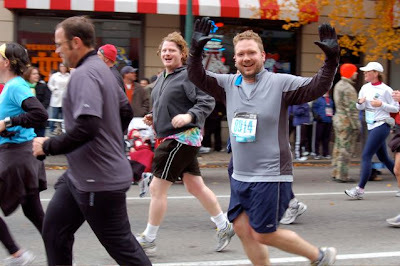 Today The Chubby Vegetarian ran 13.1 miles in 2 hours and 22 minutes. "Team Suzanne," started by my brother in honor of my mother, raised $1,775.00 for the kids at St. Jude. 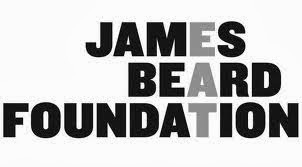 A big thank you to all of you who dished out some dough for this great cause. 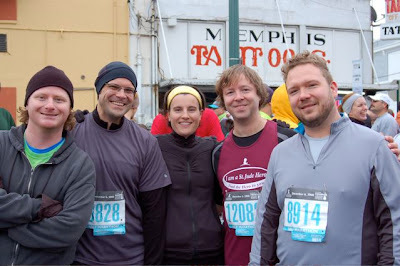 Also a big, big thanks to all of you who stood in the freezing cold and cheered on me, Kelly, Graham, Mo, and Lindsay. 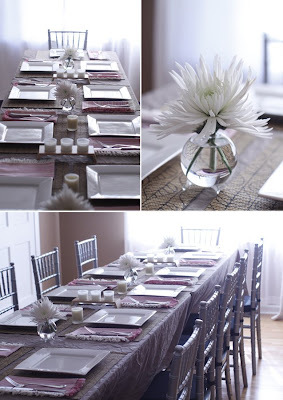 This year, like the past 3 years, we had Thanksgiving dinner at my house. This year we had eleven people over for the big meal because we were lucky enough to have The Wife's sister and her family in town from Austin, TX, and my brother and his wife who moved back to Memphis this year from Seattle, WA, and her dad as well. Add my own dad, little brother, and mother-in-law, our Thanksgiving mainstays, to the mix, and we had ourselves one large, hungry crowd. The first hurdle was to find a table long enough to fit everyone. We thought about building one, then buying one, and finally ended up renting one. It was the best option. The second hurdle was to find a room in our modest house where such a giant table could fit. There was only one option: my office. With a little help from our family, we moved years worth of stuff out of my office. We cleared it completely to make room for the table and all those who would sit around it to eat. Why, you ask? Why would we go through so much trouble just to have everyone sit together? It is important to us, now more than ever. Besides, Thanksgiving is The Wife's favorite holiday of all time. There are no presents to buy. There are no eggs to hide. No staying up 'til midnight. I think she loves Thanksgiving so much because the main goal of the day is to sit and eat great food with people you love, and who wouldn't love that? This brings me to the food. I know that the vegetarian main dish at Thanksgiving has some pretty stiff competition. It has to be something spectacular...something hearty and warm. So I decided to make a cassoulet. I have been a vegetarian since I was 12, so I had never tasted a "real" cassoulet, but Chef John Bragg served one at Circa during his totally vegetarian dinner this fall. His was delicious, and it inspired my version of this classic dish. On medium-high heat, melt a quarter stick of butter (or more) in a enameled cast-iron pot. Brown the rinsed and dried mock duck in the butter, and then remove from the pot. Add the sausage to the pot and brown it up as well, and then remove it from the pot, too. Now layer in the onions, peppers, carrots, and parsnip in that order. Allow this to cook without stirring for about 4-5 minutes. Add the white wine and scrape up any brown bits stuck to the pot. Add the beans, tomatoes, bullion, duck, and the sausage to the pot. Stir. Make a bouquet garni by tying together a few stems of each fresh herb and then drop it into the pot. Cover and bring it up to a simmer; next, stick it in a 350 degree oven for 2 hours. Check it after 45 minutes and add some water if it looks dry. At this point remove the lid, remove bouquet, and add 1/2 the bread crumbs to the top. 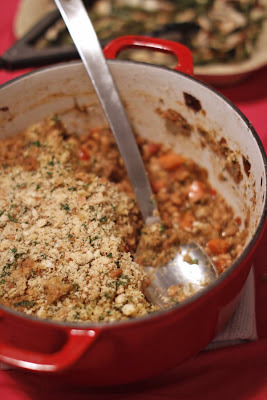 Cover and return the cassoulet to the oven for thirty minutes. These bread crumbs should get pretty wet. Cut two tablespoons of butter into the remaining bread crumbs, and them mix them with a handful of chopped parsley. Sprinkle this mixture over the top of the cassoulet, and then return it uncovered to the oven for another 30 minutes or the top is nice and brown. Wow. People honestly couldn't believe it was vegetarian. My dad teased me by saying that they call it mock duck because it is from the town of Mock, and not because it was fake. I know better. Everyone did their part. 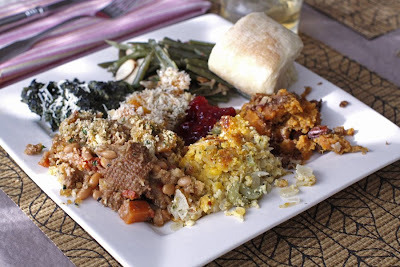 We had Lindsey's spicy cornbread stuffing, Bianca's butternut squash, Diane's sweet potatoes, The Wife's cranberry sauce, yeast rolls, baked apples, and pumpkin pie, Hunter's spinach, and my green beans. I think there was a turkey there, but I couldn't point him out. The Duck egg was wonderful . 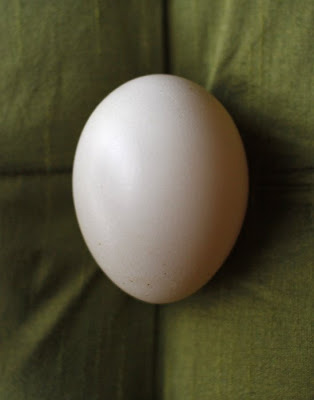 The yolk was much larger than the egg of a chicken, and the taste was far richer. Since it was my first time to taste duck egg I wanted to keep it simple and not hide the taste under ingredients that would compete too much with their mild, rich flavor. The dressing is simply equal parts olive oil and white balsamic vinegar mixed with some chopped fresh thyme. The soup is what made it a meal. I simply roasted two large carrots, one kabocha squash, and one large shallot in a 400 degree oven for 40 minutes. Peel the shallot and remove the stems from the squash. The peel of the kabosha is thin and can be eaten. Throw the roasted veggies in a blender with 1/2 up of cream and about a cup of water. Blend until smooth. Transfer to a pot and simmer on the stove. Stir in a pat of butter, lemon zest, and season with salt & pepper. I crumbled a bit of goat cheese on top before serving. What do I do with it? What would you do with it? Please leave me some suggestions in the comments section. TCV needs your help... before it is too late. 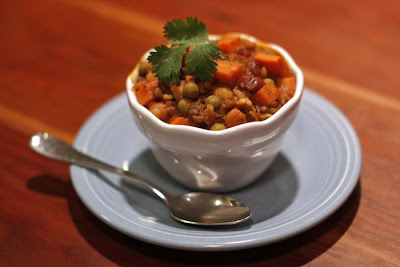 Check out our updated (11/29/12) recipe for Vegetarian Mulligatawny HERE. 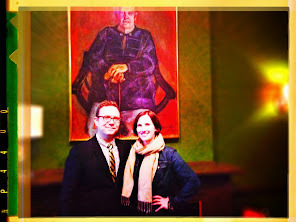 Last week our friends Kelly and Michael (of Midtown Stomp) invited us over for dinner. It is an invitation that we never turn down. They are our very good friends, and Michael can cook up a storm. He told me that he was going to try his hand at mulligatawny, a dish I had made for them some time back. I have to admit, his was way better. For the most part his recipe is typical of most that you will find. The really different and delicious part is the addition of dried cherries instead of currants, and tons of cinnamon. It was awesome, and It went perfectly with the homemade naan bread that I brought over. I begged him to share the recipe and some leftovers. Cooking implement needed: one large cast iron pot or dutch oven. Saute one medium red onion in olive oil until tender, meanwhile start a pot of water to boil. Add 1 1/2 cups of white wine & cook for approximately 1-2 minutes. Add one cup of french lentils to the pot of boiling water. Boil until tender, approximately 5-7 minutes. Add 1 32oz can of organic crushed tomatoes to the onions, garlic & wine. Fill that empty can with water & add to the pot. Add 1 16 oz can of organic vegetable broth. Add 3 medium carrots, diced. Add one head of cauliflower cut into florets. Drain the cooked lentils & add to vegetables. Add approximately 4 tablespoons of ground cinnamon, 3 tablespoons toasted & ground cumin seeds & salt & pepper to taste. Simmer for 30-45 minutes. Add one can of drained organic garbanzo beans & one can of drained organic sweet peas. Dice one small hot chili (or half a super hot one, like a bolivian which is off the skovil(sp?) scale) & add that to the pot. Add one can of coconut milk (liquid & solid). Simmer until the milk is all incorporated. Add one large handful of dried cherries & one large handful of whole cashews, taste & adjust for seasoning. Serve with plain white rice & a chilled bottle of dry or off dry riesling. If you would rather red wine, I would recommend a dolcetto. Save for puppies and long stretches of time with nothing to do, french fries may be my favorite thing in the whole world. Since I try to keep a healthy diet, I deprive myself of that type of fried goodness on a daily basis. However, every once in a while I give in to their salty siren song. This usually occurs around the intersection of Cooper and Young, ground zero for great fries in this town. The Young Ave. Deli deep fries freshly cut, skin-on potatoes in hot peanut oil, and then sprinkles them with seasoned salt. They are rustic and wonderful. The Beauty Shop takes a more sophisticated approach to their potato preparation. 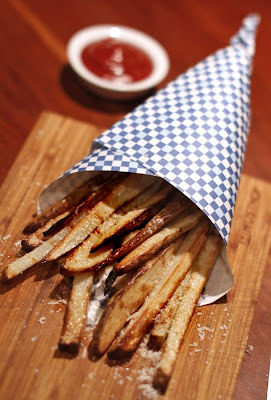 Their long, thin, crispy potatoes come out sprinkled with parmesan cheese, drizzled in truffle oil, and served in a wax paper cone inside of a silver cup. The Wife and I nearly lose our cool making sure that we get our fair share of this indulgence. Preheat your convection oven to 500 degrees. Toss the potatoes in vegetable oil, and then arrange them in a single layer on a silpat-lined baking sheet. Stick them in the oven until they are brown. This will take about 10 minutes. Remove from the oven and transfer potatoes to a plate. Sprinkle with salt, parmesan, and then drizzle with truffle oil. The minute the truffle oil hits the hot potatoes, you will find yourself mesmerized by the intoxicating aroma. Mix it all up in a silver cup with a whisk and garnish. Serves 2. Tastes exactly like a push-up pop! 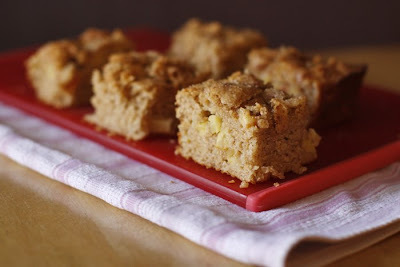 So Saturday rolls around, and I finally have some time to make Heidi's Unfussy Apple Cake. (I think poring over her pictures of this on 101 Cookbooks this week is why I began to have this craving in the first place!) As usual, I did change a couple of things for taste as well as necessity. I added in the sugar from a bag of crystallized ginger and minced five pieces of it to include in the flour mix. I also sprinkled cinnamon and ground ginger on top of the cake along with turbinado sugar. We have not been to the grocery as often as usual lately because it has been enough at this point just to make it through the day and semi-enjoy a few things about it, so we've gotten pretty lax about having a stocked fridge and a neat house and really have had to focus on the basics. We also did not have buttermilk, so I used that trick of adding vinegar to milk and waiting a few minutes to simulate it. 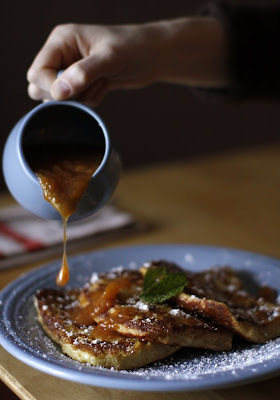 I love that you are supposed to leave the peels on the apples for this recipe: tres cute. The true test of whether a dessert is any good is if it is gone in a day, and this one passed that test. I felt like a circa-1954 housewife fetching water and coffee for Kelly and TCV once they came back from their 8-miler today as they commented upon how good the kitchen smelled. It was a great breakfast with them. Oddly enough, I remembered this morning that I was getting pumpkin bread out of the oven 3 weeks ago when I got the news about Suzanne. I just really haven't been in a dessert-making mood, I suppose, and haven't baked or cooked or put together a thing since then. Suzanne absolutely loved every dessert I created and made a point to ask me to be responsible for dessert when we did our family stuff. I think this, one of my only talents in the kitchen, reminded her of her mom, Juanita, who made the best checkerboard cakes and fried pies in the South. Check out my new band, The Perfect Vessels. Look to your right in "my other sites" box and click the link. It will take you to our my space page. 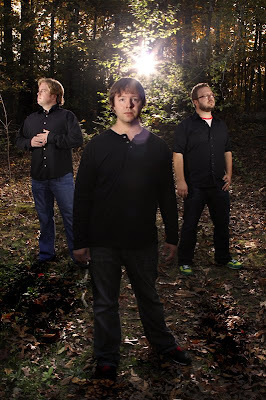 We have three songs up on the page for you to hear. Let us know what you think. If you like it, make plans to come out to see us play on December 11th at the Hi-Tone. I will freely and openly admit it: I cheated on this one. 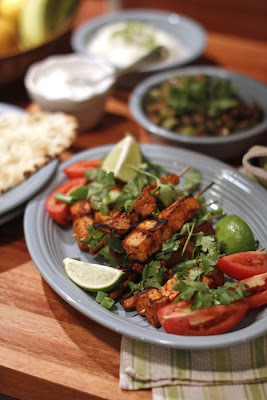 I had help from three different sources: The seitan and tofu skewers were made with a bottle of a tandoori marinade from World Market, the spices for the bhindi masala came from Fresh Market, and the frozennaan came from Whole Foods. This is really out of the ordinary for me, but with all that has been going on in my life lately, I needed a quick path to a good meal. So I followed the package instructions and then added a few tomatoes, some chopped spring onions, a couple of lime wedges, and fresh cilantro to finish things off. 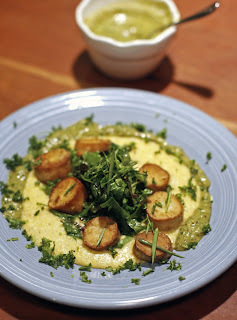 I served it all with my simple version of raita. You know what? It was great. This is one of The Wife's Favorite desserts. She is the dessert maker in our house, but this one is mine...all mine. Um, well I think that some credit goes to Jasmine Thai restaurant on Cooper in Memphis, TN. We get it there all of the time. This is a good fake though, and it is so simple. The rice, water, salt, and 1/4 cup of the sugar go into a pot along with the zest from the lime. Cooked covered for 20 minutes. Make a syrup from the juice of the lime and the remaining sugar. Serve diced cold mangos along side the warm sweet rice. Drizzle the whole thing with the syrup. You'll thank me. Just don't try to eat it with chopsticks. It is impossible. Trust me. The mushrooms, onions, and butter go into a soup pot and cook covered on low for about 45 minutes. The mushrooms will become soft and delicious. Add the champagne and reduce until most of the liquid has evaporated. Add water, bullion, garlic, salt, and pepper. Cook on low for another 20 minutes. Ladle into a bowl, place crouton on top and smother in cheese. 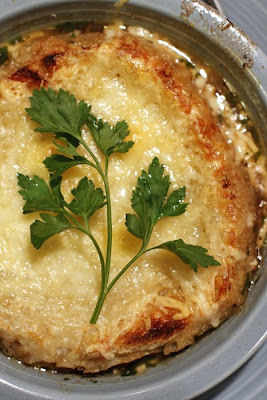 Place under the broiler until cheese is bubbling and brown. Wait. We would not want you to burn your mouth. ok now eat. For dessert you should make cute little blackberry and raspberry tarts like my wife did. I received some overwhelmingly sad news on Sunday. My mother, Suzanne Burks, was killed in a car accident south of Jackson in Hazelhurst, MS. My Dad, who was in the car with her, survived. She was not much for computers, but she loved to look at my blog. To hear her talk about it you'd think I had my own show on the Food Network. She was proud of each and every thing that I did. I hope each and every one of you has someone in your life like Suzanne. For those who knew her I need not explain how wonderful she was. For the few who did not know her, all I can say is that she was the most beautiful person in the whole world. "The best ever," as she would say. I could not count the number of lives she touched. She will be missed so much. There will be a funeral service at Hope Pres (8500 Walnut Grove Rd.) Thursday at 1:00pm. Visitation will start at 11:30. She will be buried at Memorial Park Following the service. In a large pan saute the sausage and onion until browned. Add the tomatoes, beans, and corn to the pan, and mix until all ingredients are incorporated. Spoon the mixture into the mini bell peppers and place into a baking dish. Cover and bake 30-45 minutes depending on how soft you like your bell peppers. Garnish with cheese, onion, and cilantro, and then serve with a simple quesadilla and rice. At The Wife's dreamy, Austin-esque request, I put banana slices on top of the rice. I was skeptical to say the least, but it was really good. They take on a very avocado-like quality when served with savory foods. Who knew? Not TCV, that is for sure. I loved visiting Austin, Texas this week. My sister moved there this summer, and I have been meaning to go for a while. Of course I had to try what Austin had to offer vegetarians so that I could give you the full report! After the really brief plane ride (which was less than 2 hours but seemed longer since the loquacious stranger sitting next to me kept asking me how I liked my book and where I went to college and what I was going to do in Texas -- sheesh), we stopped at Curras, the most popular Mexican restaurant in town. We got enchiladas with molé sauce, and get this: bananas were in the rice. At Curras the molé was super dark and smoky with a little bit of sweetness, and it reminded me that I have to get TCV to make this for us soon. Lord knows he has enough dried peppers and know-how to make this happen. And bananas with the rice? Weird, but somehow it's complementary, so we have to try that, too. How fun is it to see my family and share a great meal, just getting to talk and laugh and misbehave with my sassy little niece at the table! That first day alone just made my whole autumn.That night we had to buy a new air mattress after the last one had permanently deflated, it was rumored, due to some mysterious three-year-old using it as a makeshift trampoline. At the only big box store that was open late, we also found mangoes and limes for the sticky rice dish I wanted to make for everyone. I was on my own on Thursday when my sister had to work for a few hours. She felt terrible dropping me off on South Congress for a day by myself, but I was fine with it because I love an adventure along with having a big chunk of time to meander alone in a strange new city. I jumped out of the car and started my day on her recommendation at Jo's, a little coffee shack which already had lots of people milling around out front. I ordered a huge latté and a cherry orange muffin and sat at a communal table to text everyone else in my family and to read offhandedly. The book Kelly gave me before the trip was so good that I plowed through 150 pages before I knew it and then decided it was time to explore. 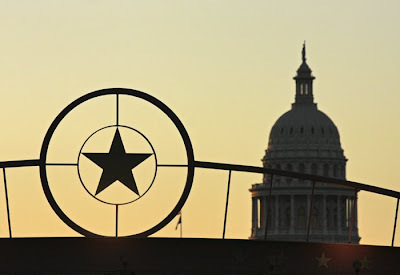 The South Congress area is a place my 16-year-old self would have loved, and you know, I am not that different of a self 15 years later, so it was a blast. There was a bizzare-o candy store Hunter would have loved (I passed up the dark chocolate bacon, but just barely), wacky antique markets, vintage everything, and a really nice restaurant called Enoteca Vespaio. I didn't mind eating by myself; I think it's kind of funny to gauge other people's reactions to it. They sat me at the bar and I just looked around and thought about what I would say about the place. 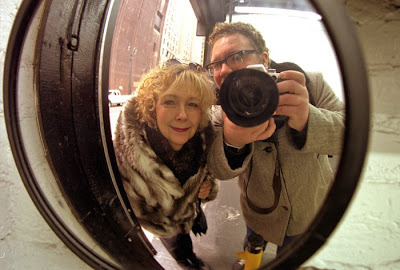 It is kind of like a place that caters to people my age, but it would seem really hip to people my parents' age. I ordered the spinach salad with fire-roasted red peppers, radicchio, creamy gorgonzola, mushrooms, and one dense, square crouton that was exactly like, of all things, a cheese straw. I also had the sugar pie butternut squash gnocchi with sage butter and parmigiano-reggiano cheese, which was doing the backstroke in butter. I actually had to tap it on the side of the plate to assauge my conscience. Since my sister and I discovered via her scale that I have lost 15 pounds since she last saw me in early July (yay, running and moderation! ), well, I think about these things now, and I used her trick of just eating half of my entreé since it was just okay. I had to get some 35 cent almond-cornmeal cookies on my way out, though. I make every exception for dessert. I looked across the street and saw Hey, Cupcake, the adorable Airstream trailer with a rotating pink cupcake atop it and knew we would have to rendezvous another day. On my last full day, we decided to cook like crazy. We went to the 'world headquarters' of Whole Foods Market in downtown Austin for lunch and to shop for dinner. Nothing could prepare me for this. There. Were. Escalators. There were so many options for lunch that I just chose some African stew and fried plantains and agua fresca before we headed up to the vast rooftop deck to eat. My sister only shops there once a week, and I understand why. There are so many specialized sections, and the store is buzzing with so many people on sensory overload that it can be exhausting. For TCV, I found blue cornmeal, roasted chili-lime cashews, and freshly ground chocolate peanut butter. My sis got the ingredients for pizza. That afternoon, she made the dough with half unbleached flour / half whole wheat. Her neighbor offered us some french tarragon from her garden (that's how sweet the neighbors are in Travis Heights - the same woman brought us homemade chili the day before), and Linnie taught me how to make a tarragon-parsley pesto. She put that along with sliced peaches and roasted almonds on one pizza and then made a traditional mozzarella, mushroom, and pepperoni one as well. Really good with the Mark West pinot we chose for the occasion. It was in the cards to drop by Hey, Cupcake later that night, and we had the Standard, the Vanilla Dream, and the Michael Jackson. I must say that after having Verité cupcakes in Seattle this summer and Hey, Cupcake ones this week, our own Muddy Bake Shop cupcakes still win my national cupcake challenge for 2008. If you have not been to Muddy's (in the Sanderlin Center way behind Clark Tower), you are doing a disservice to yourself and to the City of Memphis. I am dead serious. Hey, Cupcake's Airstream-and-Christmas-lights atmosphere is picturesque, and I do give them a few points for an adorable experience. 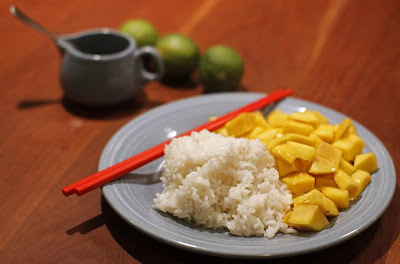 The last day, my mangoes were finally ripe, and so we had the mango-lime sticky rice for breakfast. At my repeated and feverish requests, TCV developed the recipe for me after we tried this dessert at Jasmine, that great Thai restaurant in Midtown. My niece loved the dish, so I have a feeling that she will be asking for it again, too. I hated to leave my girls back in Austin, but we are already planning to reunite back here in town very, very soon. 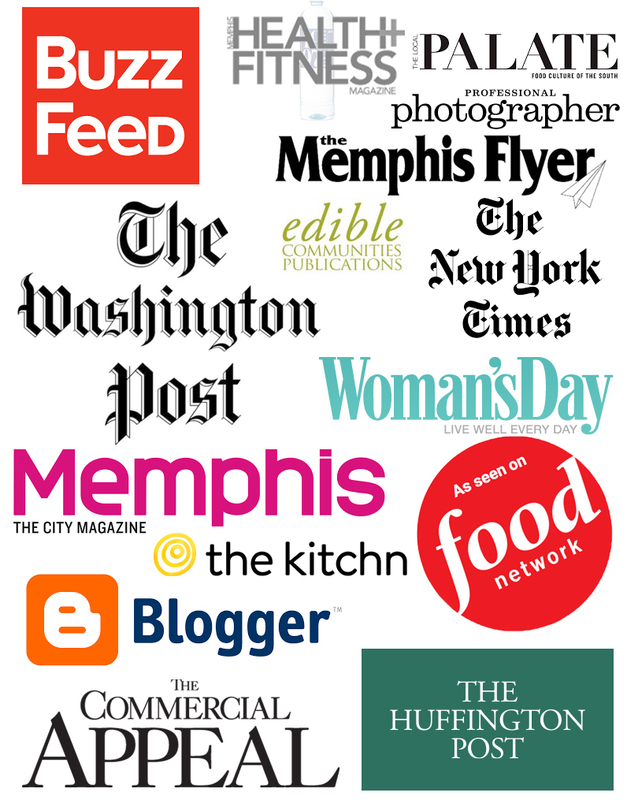 The Wife and I have a piece in the new Edible Memphis called "Beyond the button." In the Story The wife struggles with her curiosity and repulsion of our favorite edible fungus. 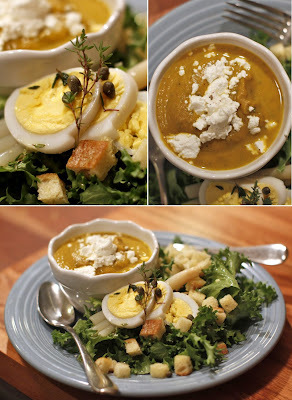 TCV contributes photos and recipes. Go get it. 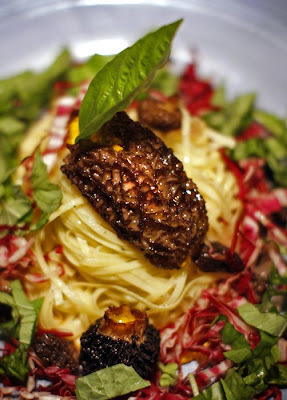 IN the meantime, make this delicious mushroom pasta. Rinse and dry morels. Boil carrot and garlic clove until soft (about 10 minutes). Combine carrot, goat cheese, and lemon zest in a food processor. Blend until smooth. Transfer mixture to a pastry bag. Pipe goat cheese mixture into the morels and then brush the outside of the mushrooms with olive oil. Season with salt & pepper and place in an oven set to low heat until ready to serve. Cook shallot in butter until translucent. Add white wine and reduce. Toss cooked pasta in the shallot, butter, and wine mixture. If it looks a bit dry, add some pasta water. Portion pasta on to a plate and then sprinkle it with raddichio and basil. Top the pasta with the stuffed mushrooms and a basil leaf. All right, my vegan friends, plug your ears and cover your eyes, 'cause I'm about to say something you're not gonna like. There is no substitution for real butter. I'm not talking about the fatty, flavorless sticks that you find at most supermarkets. I'm talking about Plugra, a European-style butter that has an intoxicating aroma and a delicate flavor. It has the power to transform the simplest ingredients into mouth-watering masterpieces. This morning my friend Kelly and I went for a 5.5-mile run around East Memphis, then joined The Wife and Michael for brunch in our backyard. Michael brought bottle of Prosecco that he mixed with a homemade raspberry syrup which turned the bubbly a beautiful shade of magenta. It was so much fun. The weather was beautiful, and our dogs provided plenty of Wrestlemania-style entertainment. 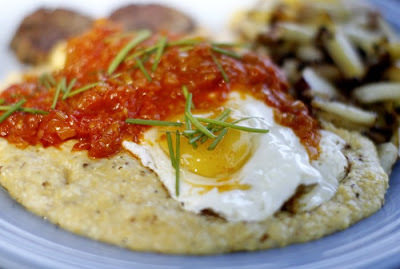 For our meal we had thyme & rosemary scented potatoes (thanks, Michael), homemade mushroom-sage sausage, and cheese grits topped with a fried egg and tomato-leek confit...which brings me back to the butter. Everything goes into a pan on the stovetop. Simmer while covered on low for an hour. Remove the lid and raise the temperature to medium. Reduce until thickened. Serve over eggs or potatoes or anything you want to become more delicious. In a pan over high heat, dissolve the bullion into the water, then grate in the ginger and garlic using a microplane. Add a few dashes of braggs and give it a taste. Adjust the seasoning to your liking. Add the vegetables and the seitan, and then allow to cook for a few minutes until the carrots begin to become tender. At this point add the oil and the noodles. The noodles will generally cook in two to three minutes, but check the package instructions to make sure. 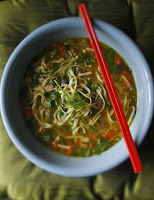 Dump the soup into a big bowl and garnish with chopped cilantro and chives. 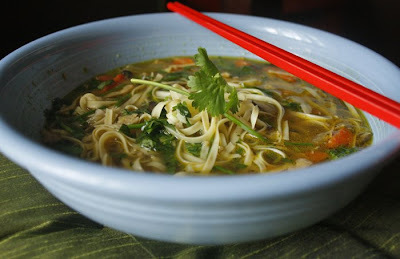 I like to start eating this dish with chop sticks and end by slurping the broth right out of the bowl. Feel free to add any vegetables to this soup that you have lying around. I make it a little different every time.Broccoli, kale, spinach, or edamame would all make terrific additions to this dish.